What is Veganism? It is a way of living which seeks to exclude all forms of exploitation of, and cruelty to, animals for clothing, food or for any other purpose. The people who follow such way of living are called the Vegan. Abhi!! 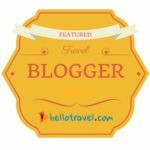 How come a travel post is related to Veganism? A couple of days ago, I was a bit lucky to do the Garbett Point Trek with a vegan mountain climber “Kuntal Joisher”. Who is Kuntal Joisher? 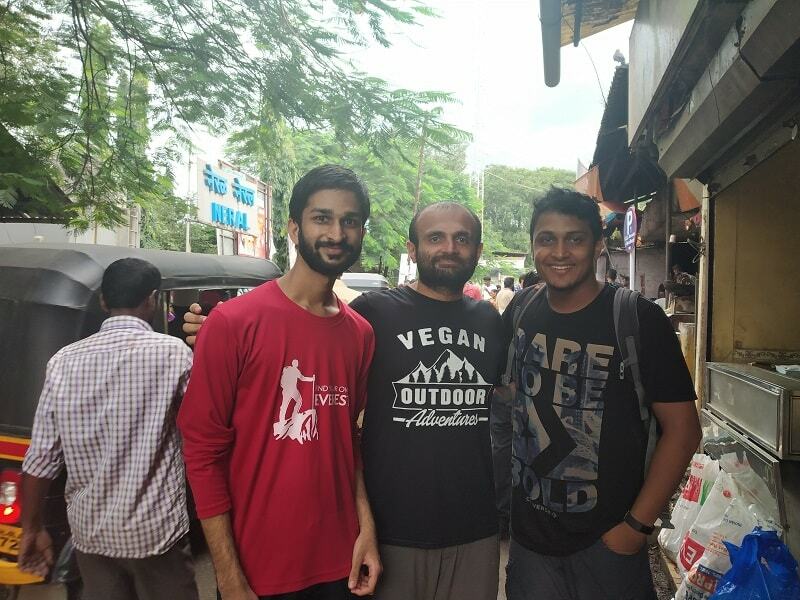 Kuntal is a vegan mountaineer and a software engineer based out of Mumbai who became the first human in the world to have ascended any 8000-meter mountain (Mt. Lhotse) living a 100% vegan lifestyle. He is also the first mountaineer to have climbed Mount Everest on a completely vegan diet. I met Kuntal on my way to Everest Base Camp in the year 2016 and since then I have been following him quite closely. Oh! I may end up writing endlessly on the life of Kuntal. 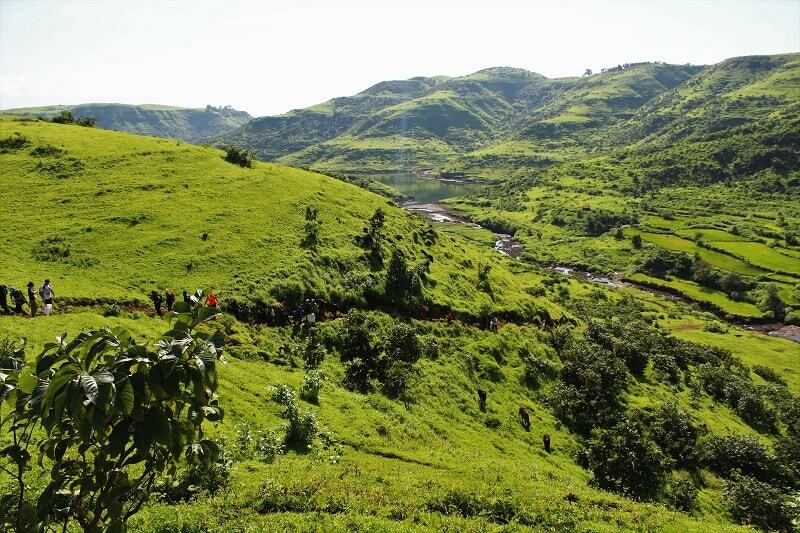 So, let’s first talk about the Garbett Point Trek. 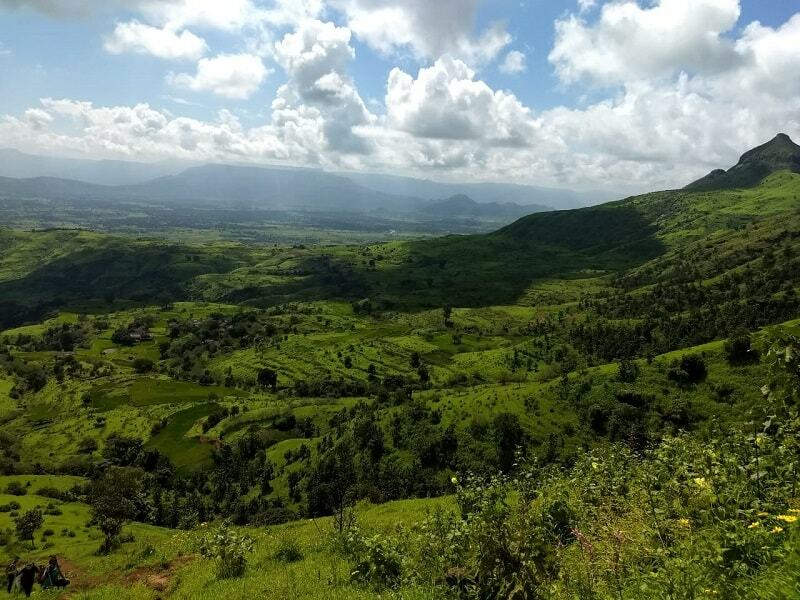 Situated about 5 kms from Matheran Railway Station, in the hidden hilly regions of Bhivpuri village in Diksal, Garbett point offers a panoramic view of the lush green Sahyadri mountain ranges nearby. 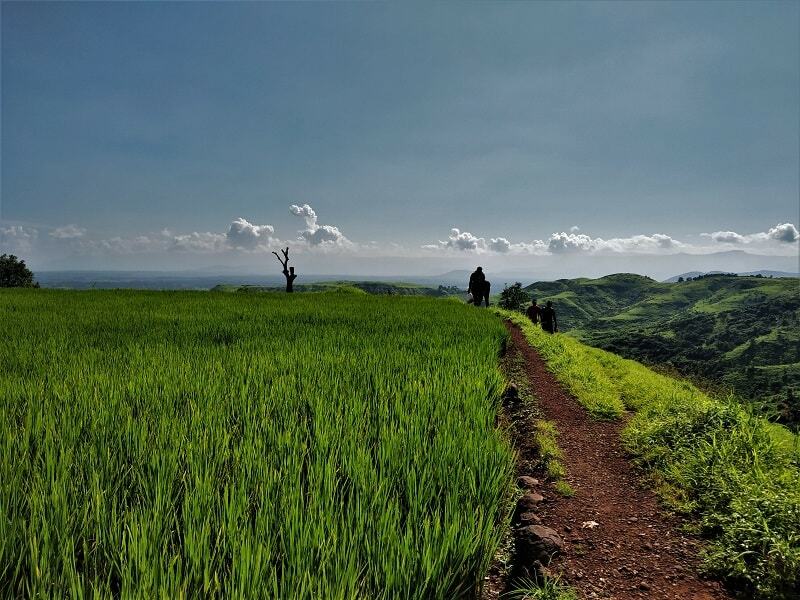 Garbett point trek is a one-day adventure trek filled with untouched natural beauty and is a perfect option for those who are looking for a quick weekend gateway from the city of Mumbai/Pune. 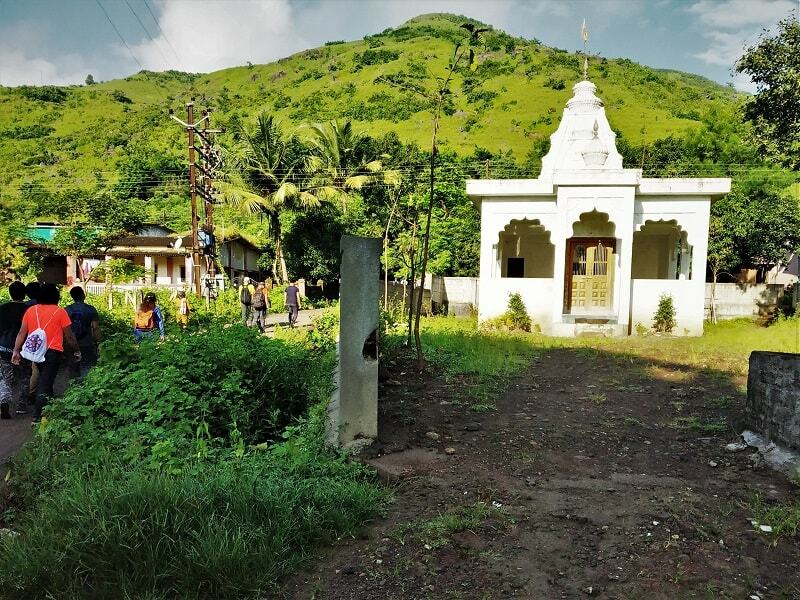 This particular trek was organized free of cost to raise awareness and funds for Sunsar Maya of which Kuntal is one of the Board of directors. Sunsar Maya is a non-profit organization that works to provide educational opportunities, emotional support, after-school care, nutritious meals and regular health check-ups to the orphan and vulnerable young minds in Nepal. 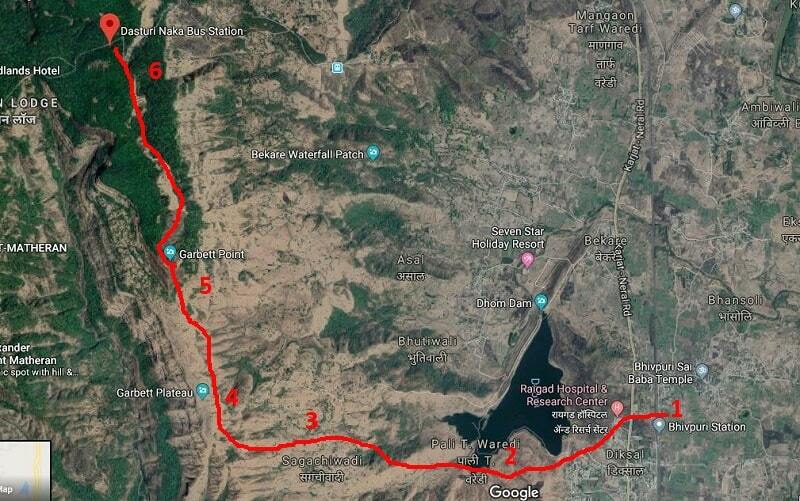 The cheapest and the convenient way to reach Garbett Point Trek base village (Diksal) is via railways. The nearest railway station is the Bhivpuri Road station which is just a few meters away from the Diksal Village. 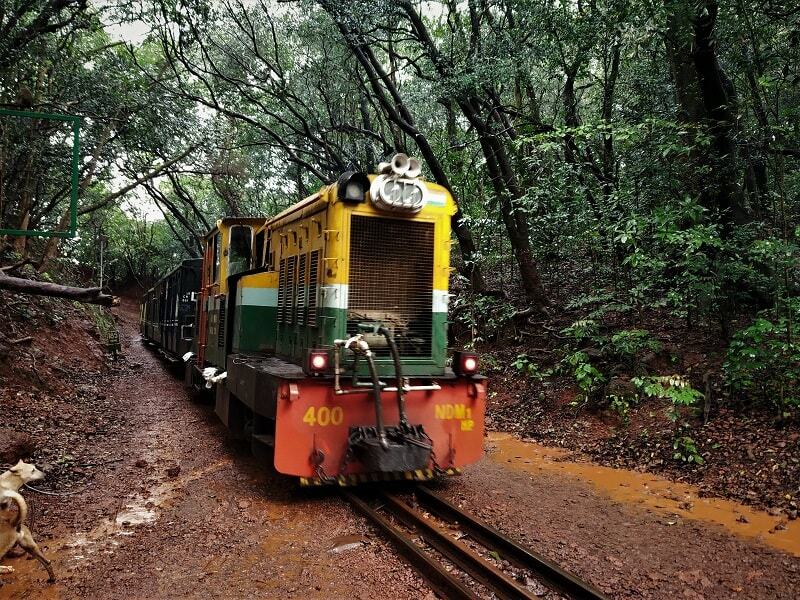 For those coming from Mumbai, you can catch a Karjat bound local train and get down at Bhivpuri Road station (E.g. CSTM 4:50 AM – Bhivpuri Road 06:58 AM). 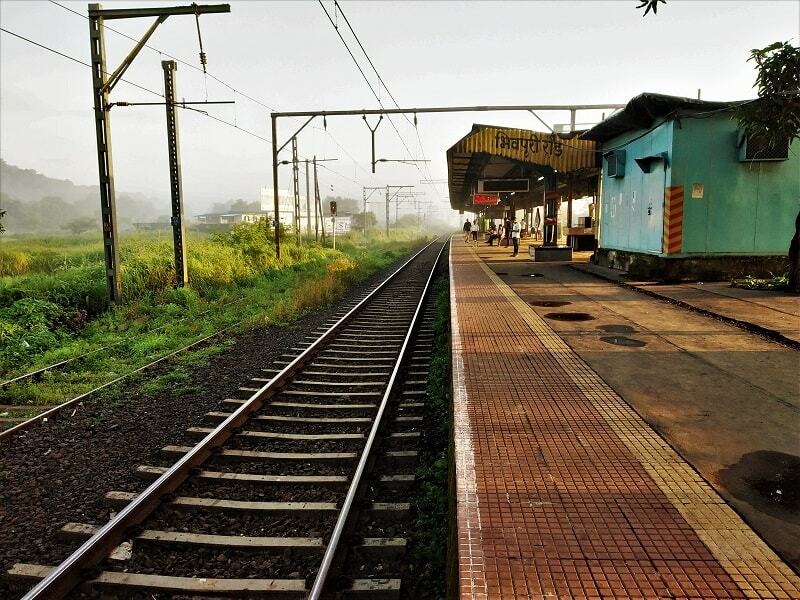 If you are coming from Pune, you can catch an early morning train for Karjat and then another local train for Bhivpuri Road Station. 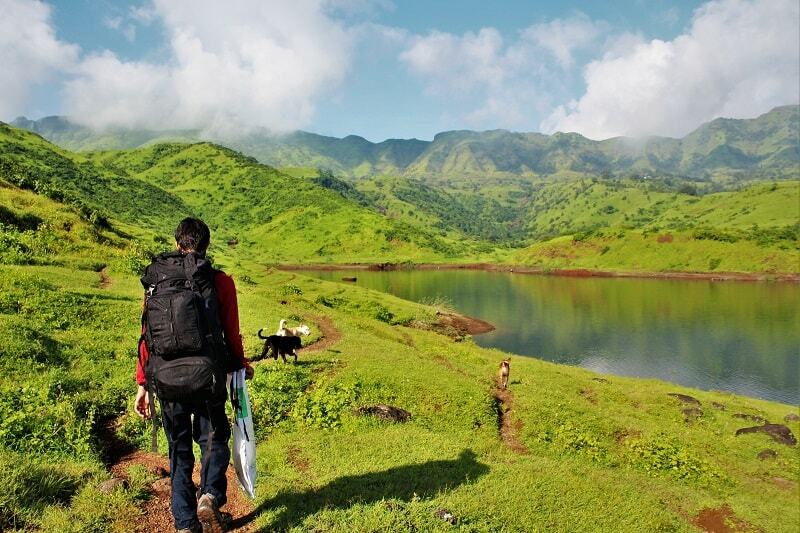 At Bhivpuri station, you can ask anyone for the route to Dhom Dam (Diksal village) which is the start point of the trek. For the return journey, you can take a shared taxi to reach Neral from Dasturi Naka (end point of Garbett point trek). Local trains from Neral are available to reach other parts of Mumbai. 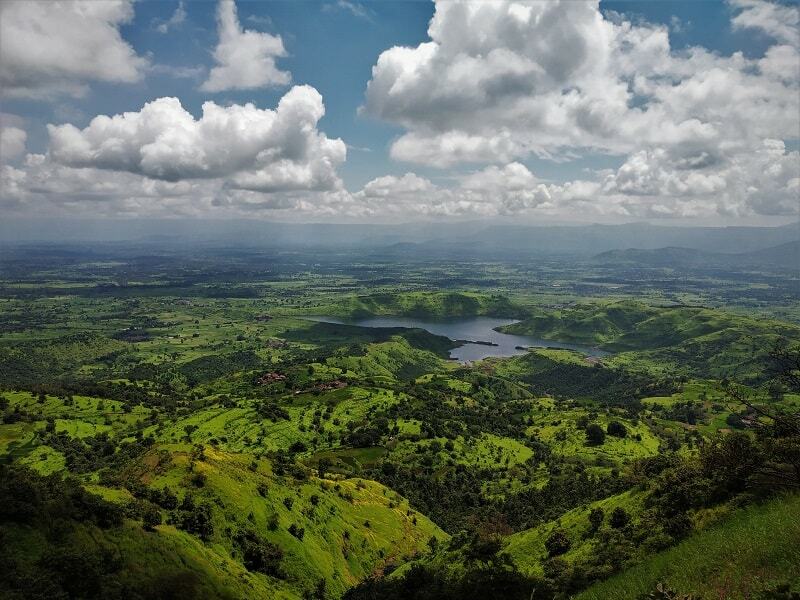 I would rate Garbett point trek as a moderate level trek in terms of difficulty. It generally takes around 4-5 hours to complete the trek –> 3-4 hours of ascending to reach the Garbett Point from Diksal Village and 1 hour of descending to reach Dasturi Naka which is the end point of the trek. 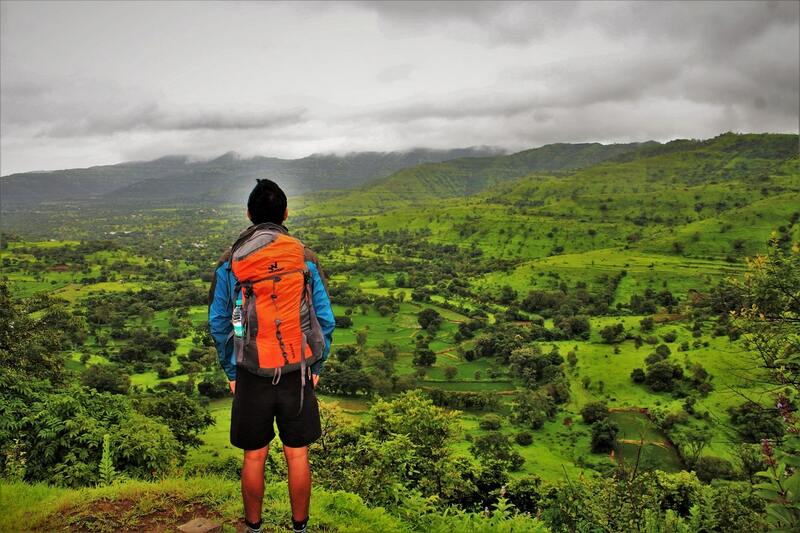 Few stretches while ascending are quite steep and one needs to be extra careful while trekking in monsoon season as it becomes quite slippery. 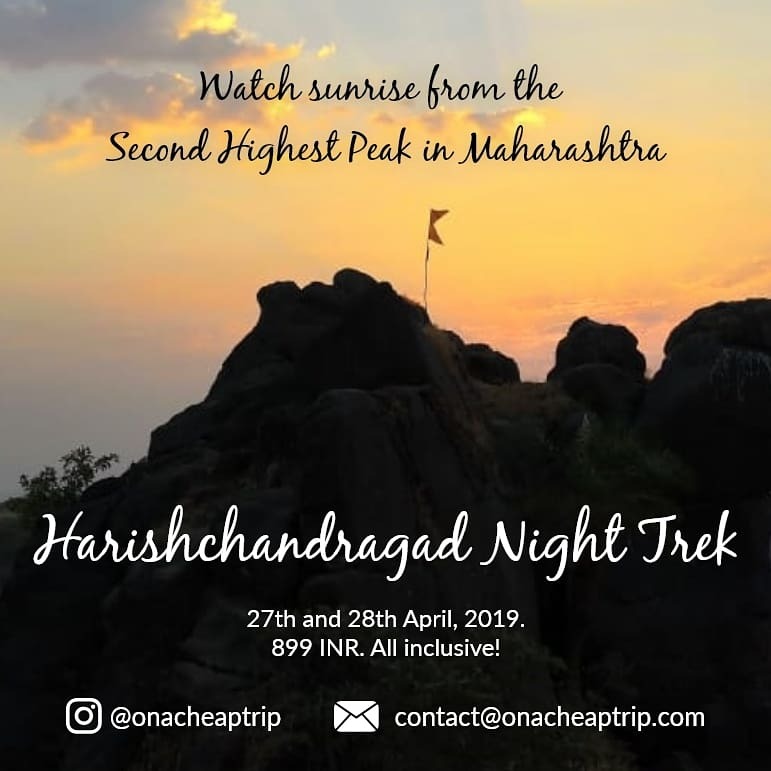 If you are planning to do the trek in summers, I would recommend you to start your day early as it becomes extremely hot in the afternoon. A couple of weeks ago, while scrolling through the news feed on my Facebook account, my eyes glued to a post by Kuntal. 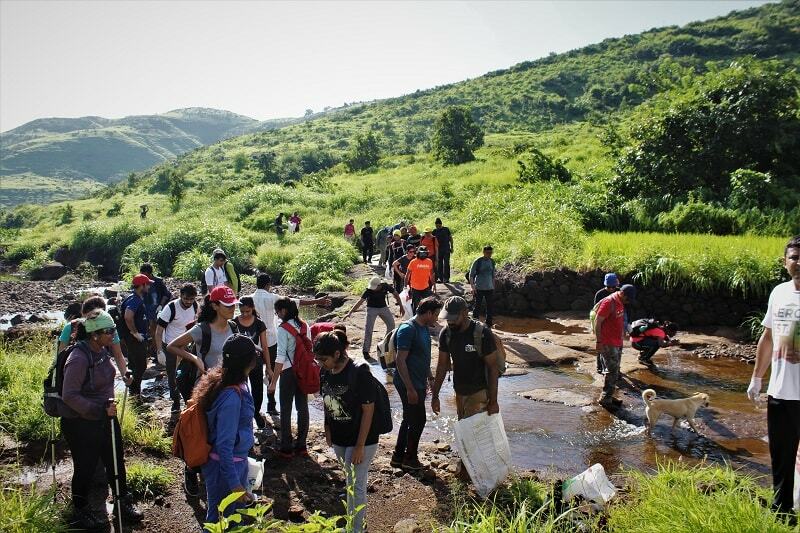 He was planning to organize a moderate grade, one-day trek, zero waste, and vegan-friendly hike to Matheran via Garbett point as a part of the first-ever “Walk, Hike, Go” to be held in India. Without a second thought, I texted him and asked him if could join him on this trek. Woo-hoo!! I was on cloud nine!!! I was super excited to do a trek with one of my inspiration. Last time, when I met him on Everest base camp trek back in the year 2016, we barely interacted for a couple of minutes. But in the short interaction, I was so much inspired by his way of living the life. We exchanged our social media handles and I wished him good luck for his Everest expedition. 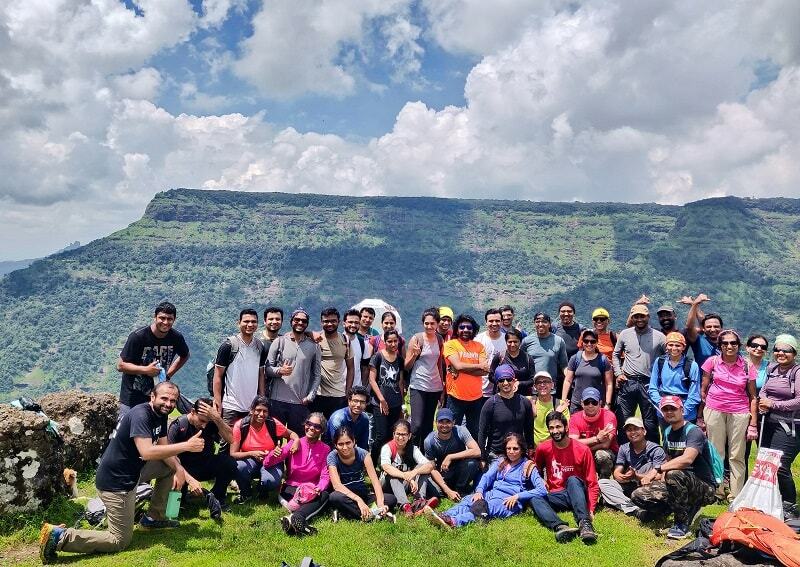 15th September 2018 – Finally the day arrived for the Garbett point trek!! I started from Pune around 3:30 am and took the Latur CSTM Express train to reach Karjat by 6:00 am. 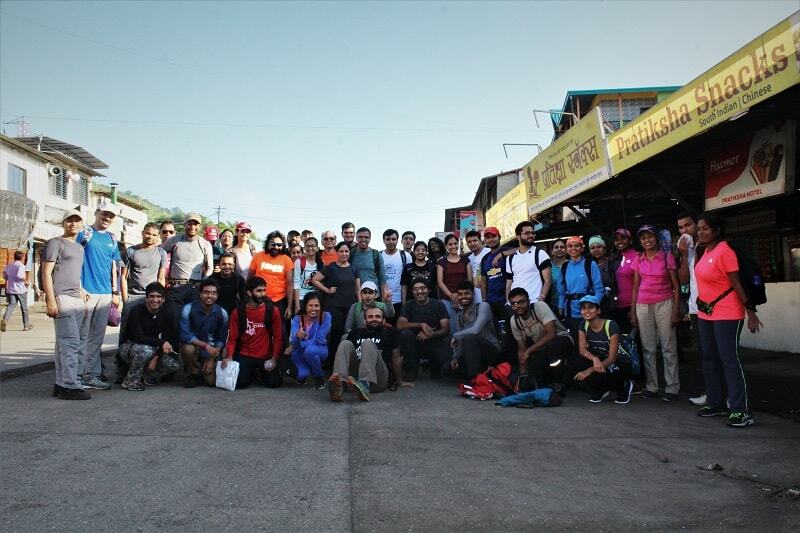 From Karjat station, I took a local train and reached Bhivpuri road station which was the planned meeting point of all the fellow trekkers. Within a few minutes, everyone arrived and we were around 50 in the count. Yes, you heard it right!!! And Kuntal was one among them, I was so happy to see him after so long. After a brief introduction, we headed towards the Diksal Village where we had breakfast. 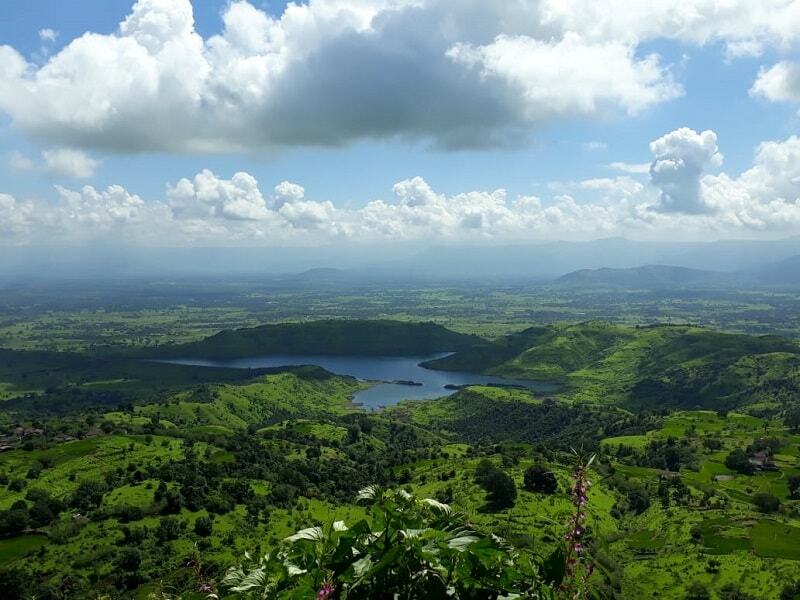 The initial trail is a dirt road, which passes next to the Tatoba Temple and takes you to the Dhom dam which is also known as Bhivpuri Lake. The view of the dam with huge mountains in the backdrop covered under clouds was a perfect moment to capture. We could see a roaring waterfall in the distance and there were quite a few around Garbett point trek route. 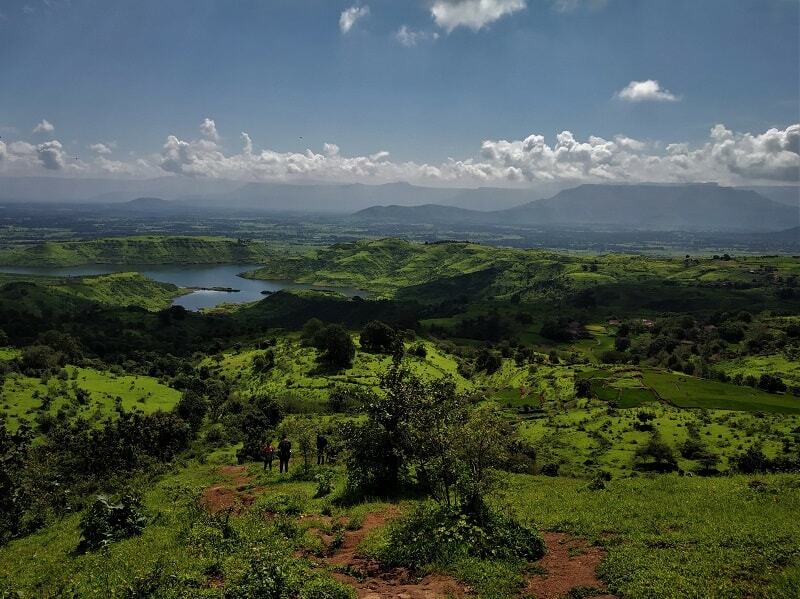 After walking along the Dhom Lake for around half an hour and climbing a small steep hill, we made it to the first landmark- “The hill with a huge tree”. It was a day of blue skies with the sun shining to its brightest; the weather was extremely hot and humid, a rarity in Mumbai during this time of the year. 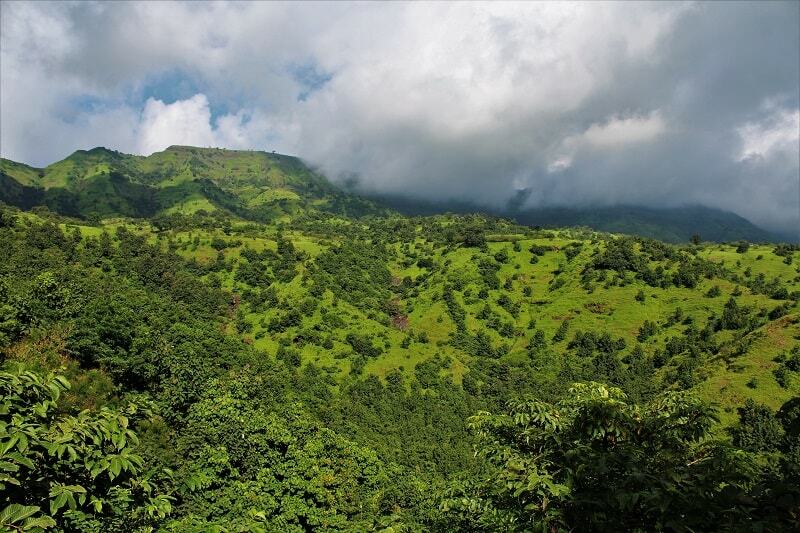 The breathtaking views of the lush green surrounding regions kept us motivated to move further. 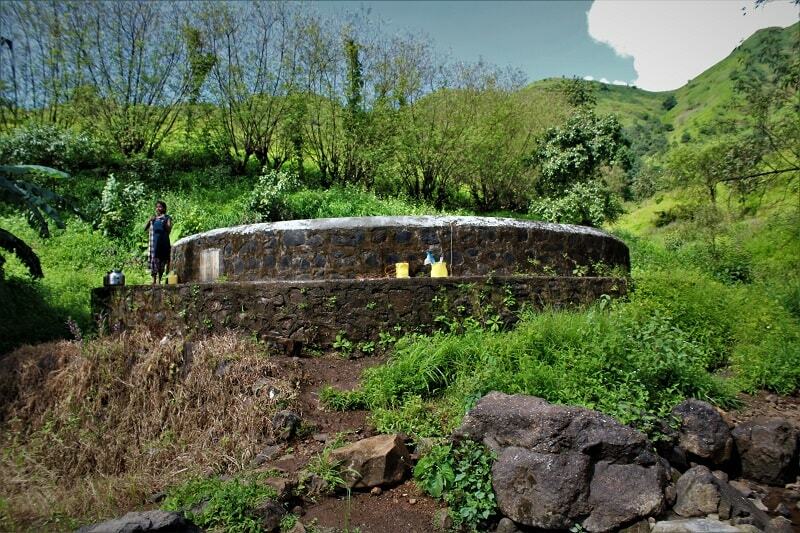 Our next stop was at a small village Sagachiwadi which is built on the hilly terrain. 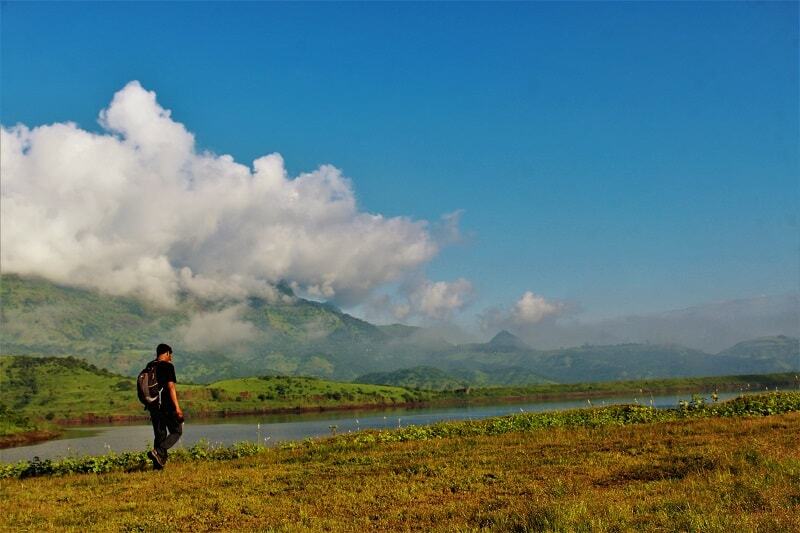 Walking across numerous paddy fields at such altitude was a moment to remember. You can ask for directions from the villagers, they are very helpful and will be more than happy to help you. Also, you may get your water bottles filled here. The further climb from the village is very steep with again a big tree as the next landmark. From here you can sense that Garbett Plateau is just nearby. After hiking for around 20-30 minutes, we finally made it to the Garbett Plateau. Wow!! I haven’t seen anything much greenish!! 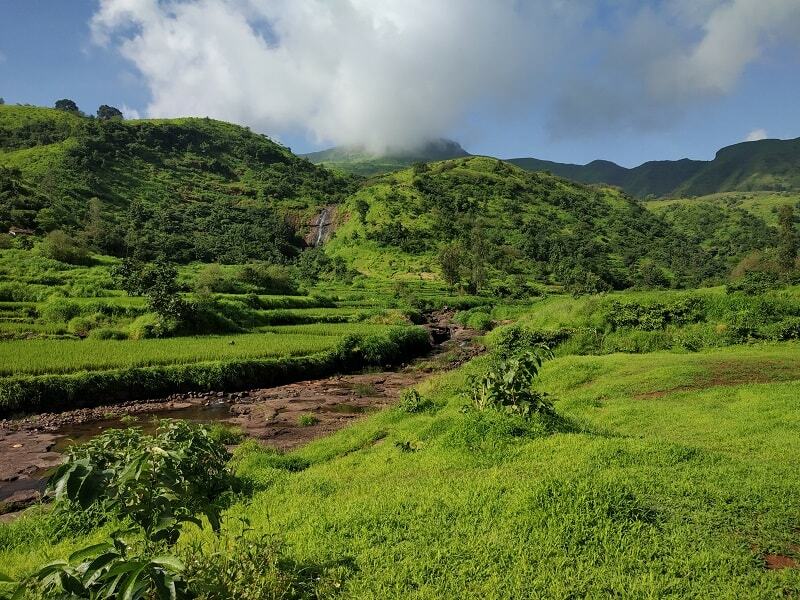 The plateau reminded me of the childhood paintings with lush green carpet and small huts and water bodies in the vicinity. Almost every one of us lay down on the vast plateau, the blistering heat had already knackered quite a bit. 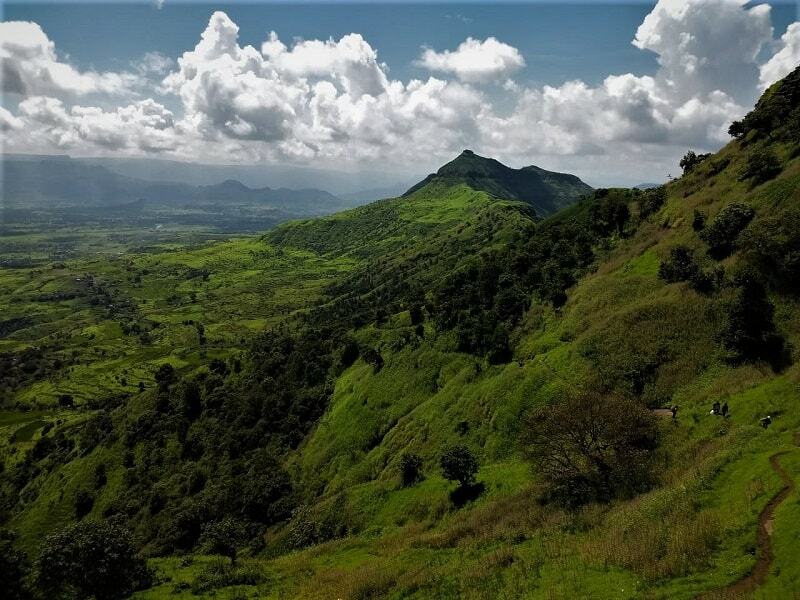 At the plateau, one has two alternatives to choose from, either climb up the steep section to the Garbett point and descend to the Dasturi Naka (end point of the trek) or take the longer route amidst jungles (30-40 minutes) to reach the Dasturi Naka. Being such a huge group and keeping safety in view, we decided to take the longer route. Owing to the extreme humidity, the sky finally opened up and it started pouring down heavily. We were enjoying every bit of raindrops falling over our tired body. Within a few minutes, I was completely drenched. All the tiredness was gone!! Thank you rain Gods for being so kind on us. After walking for half an hour, we finally made it to the Dasturi Naka. During the entire trek, I loved every bit of my conversation with Kuntal. I was so happy to know more about him, and wish I could follow his lifestyle, especially the “Veganism”. After reaching Dasturi Naka, we took a shared cab for Neral (INR 70) and decided to do lunch over there. It was time to put an end to yet another exciting trek. With all the happy memories, I boarded into a train for Pune. As such, there is no stay option at the Garbett Point trek. One can pitch a tent somewhere on the Garbett Plateau but remember winds are generally quite strong at the plateau and putting a tent would be tough. 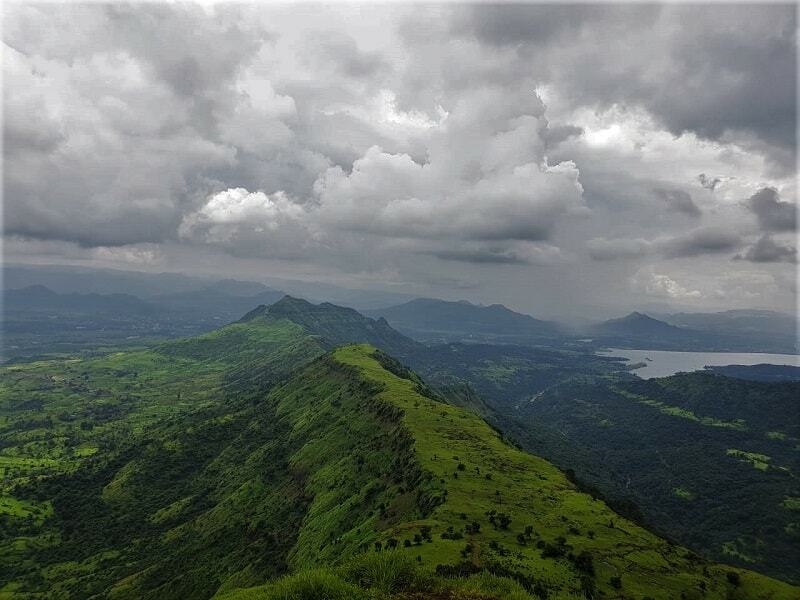 One can combine the Garbett Point trek with Matheran trip and stay somewhere in Matheran. 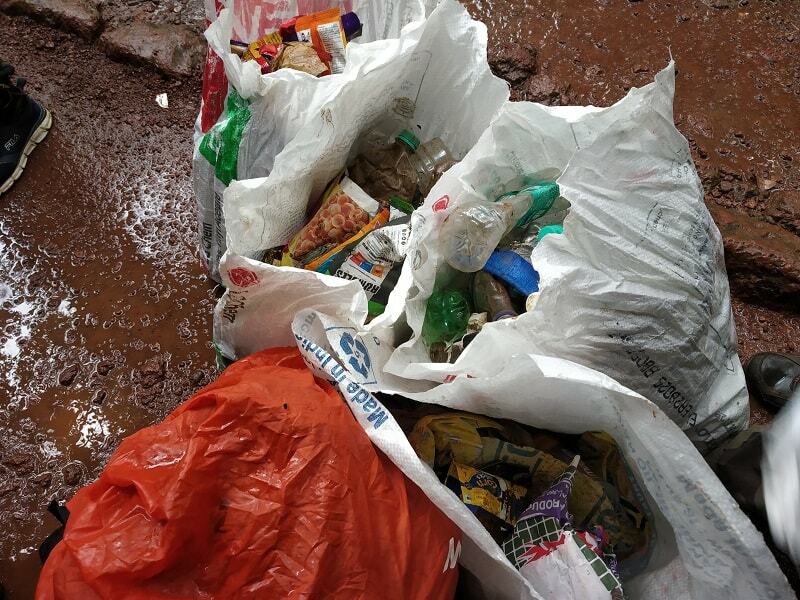 For more details, check out my earlier post on Matheran. 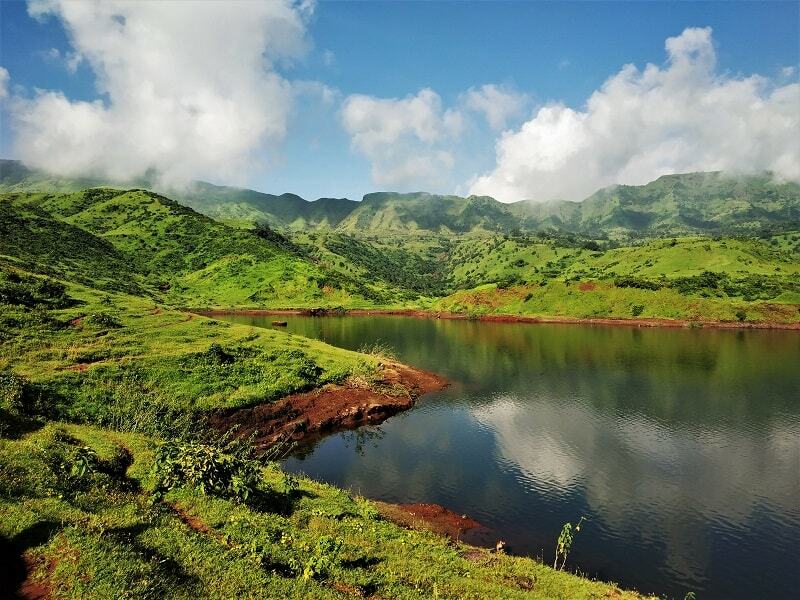 At the start point, there are few dhabas which serve the local Maharashtrian food. 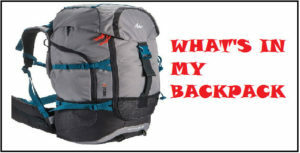 There is no food option along the trek route, so I would advise you to carry all the eatables along with you. Also, remember to carry at least 2 water bottles with you. Once you finish with the trek, you can have delicious lunch at Dasturi Naka as there are few food options available over there. 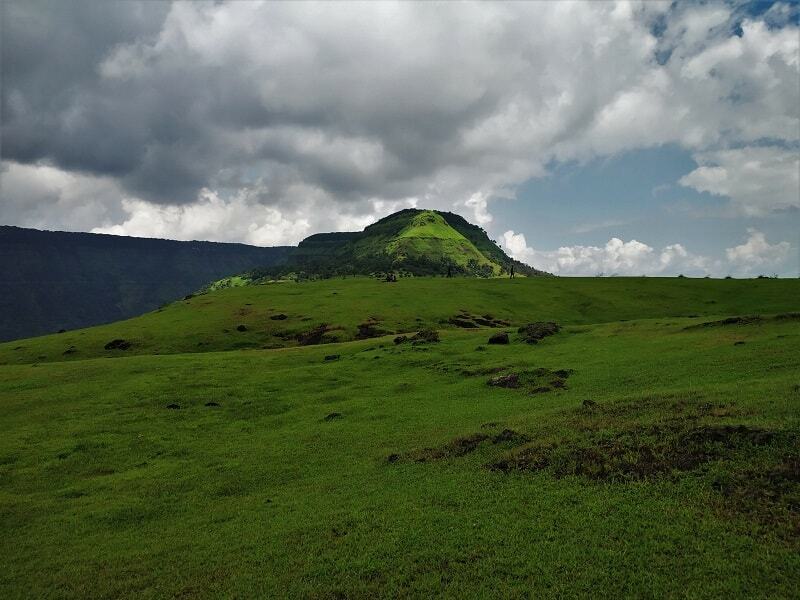 Undoubtedly, the rainy months of July, August and September is the best time to visit the Garbett Point trek as the surroundings are lush green and the weather is extremely pleasant. But remember, for the most part of the day the surroundings may not be visible from the Garbett Point due to the heavy fog. 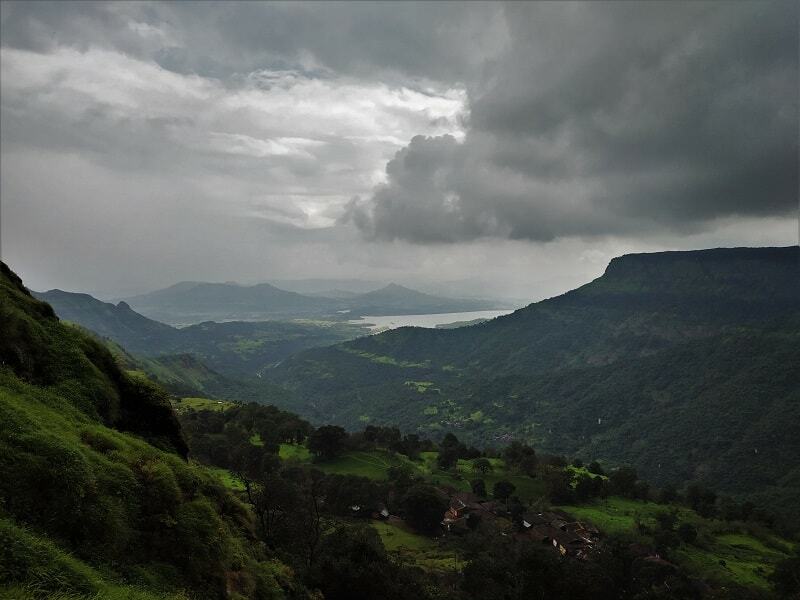 September to February will be the perfect time to visit Garbett point trek if you looking to have a glimpse of Dhom dam and its nearby regions. Summers are extremely hot so I would advise starting with the trek very early. 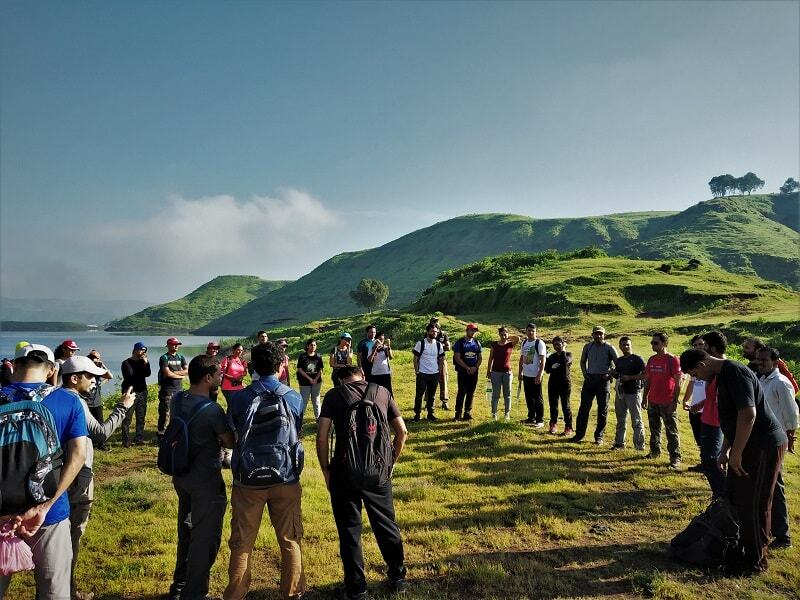 The trek was organized to raise awareness and funds for Sunsar Maya. Giving is not just about making a donation; it’s about making a difference. A long-term wait to do a trek with one of my inspiration Kuntal finally got fulfilled. Hopefully, I will be joining him for more treks in the near future. Great article. 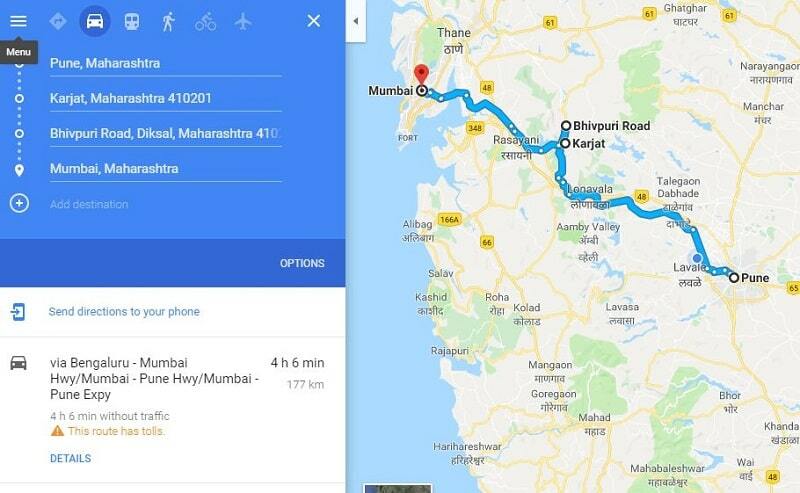 I was planning to visit this place for quite a while and looking at your description of the place, I’ll be travelling there with a few of my buddies. Keep up the good work. Excellent description and compilation. 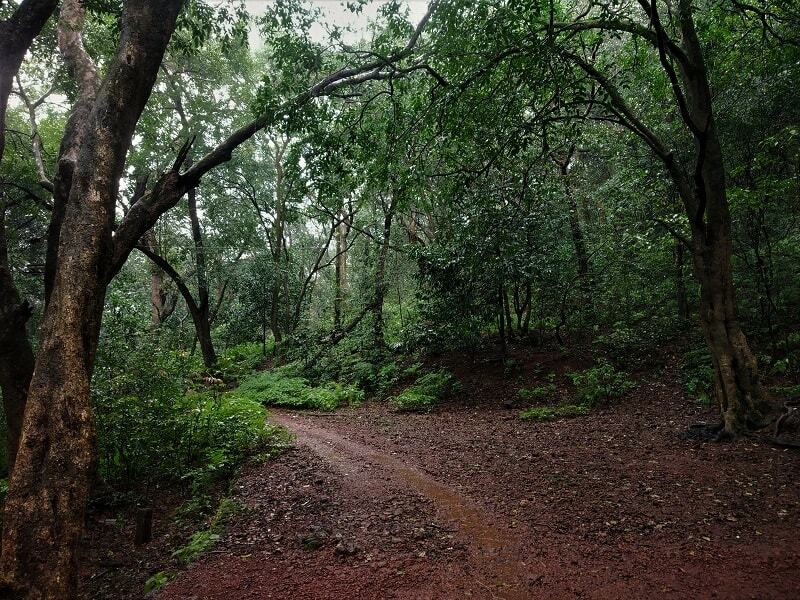 Was a Joyful Trek amidst Nature. Future is Vegan!